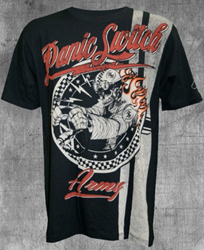 Panic Switch Army and NASCAR's Kevin Harvick debut new t-shirt design. “I have seen some of Luke’s work in the past and look forward to the fans having the opportunity to see the new Panic Switch shirt they designed,” NASCAR driver Kevin Harvick said. Kevin Harvick, NASCAR driver of the No. 29 Budweiser Chevrolet, has partnered with action sports apparel line, Panic Switch Army, to debut a signature t-shirt. The Panic Switch Kevin Harvick “Phantom” t-shirt in black boasts a bold design and the signature logo on the back. Harvick is at the pinnacle of his career, with 74 wins in NASCAR’s top-three divisions as he enters the 2013 season. His success on the track and passion for speed aligns with the Panic Switch Army way of life. “I have seen some of Luke’s work in the past and look forward to the fans having the opportunity to see the new Panic Switch shirt they designed,” Harvick said. In his 13th season in the NASCAR Sprint Cup Series ranks, Harvick and the No. 29 Budweiser Chevrolet team look to continue their success as they prepare to contend for the 2013 NASCAR Sprint Cup Series championship. In addition to his action in NASCAR’s Sprint Cup Series, Panic Switch Army fans can also catch Harvick making limited appearances in the Nationwide and Truck Series. Panic Switch Army, Southern California's new gasoline-fueled action sports apparel brand, founded by former Silver Star owners, Luke Burrett and Charis B., is inspired by extreme sports and music that caters to an adrenaline-charged lifestyle.